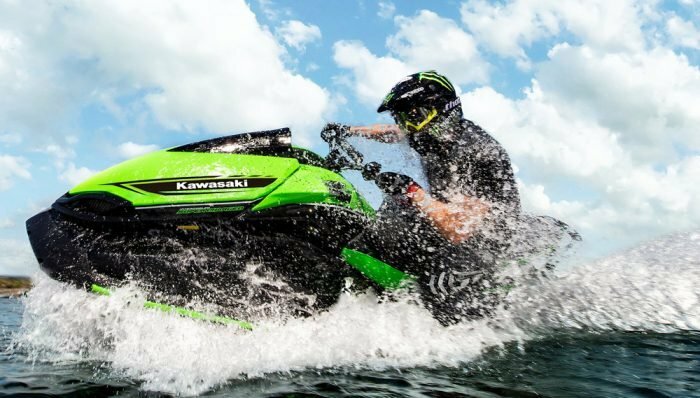 The 2018 Yamaha EX Sport offers budget pricing with enough fun attached so owners will gladly use it for years to come. Affordability is in, but not at the expense of fun. 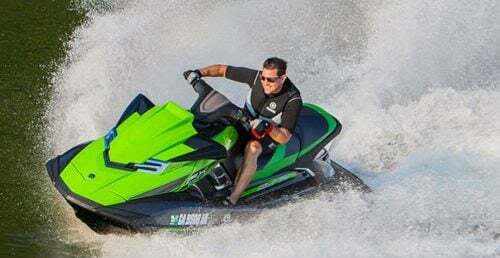 The 2018 Yamaha EX Sport offers both, enticing newcomers with a low price tag while offering a ride that, while great for beginners, won’t bore experienced riders. It’s a good combo…all for less than $7,700. 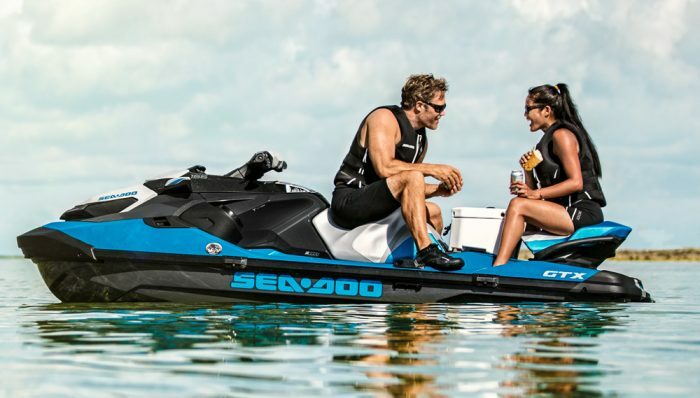 The EX series is the first line from any manufacturer to really compete with Sea-Doo’s highly affordable Spark, but en route to its low price Yamaha refused to compromise on details the company deems crucial to the WaveRunner experience. Take the boat’s size. 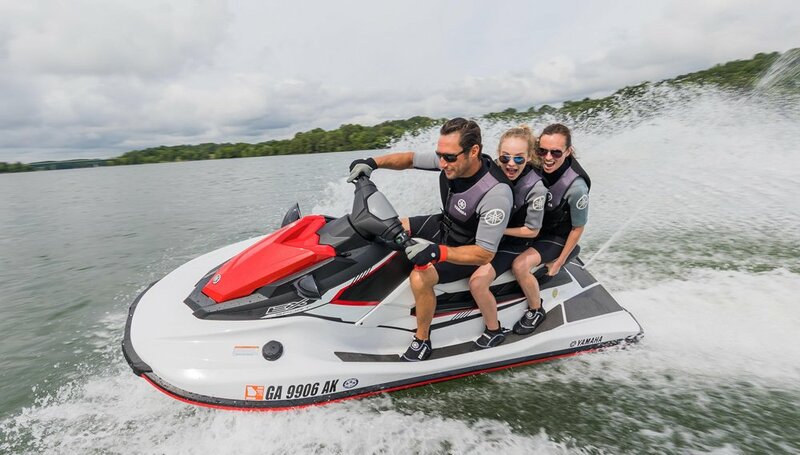 The 2018 Yamaha EX Sport’s 10’ 3” LOA is 9” more compact than the previous VX (now the company’s midrange player), but you can still ride comfortably three-up on occasion, even if that third passenger is an adult (capacity is 529 pounds). No, it won’t be roomy, but it’s nice to know you can do it when necessary. That smaller size also doesn’t come at the expense of stability. The hull was based off the VX, and stability remains top notch, whether in calm conditions or rough. The EX personality is also equal parts playful and precise. You can carve a tight corner when desired or get your weight off the stern and spin and slide. Horsepower is Rec Lite level, but so too is weight. 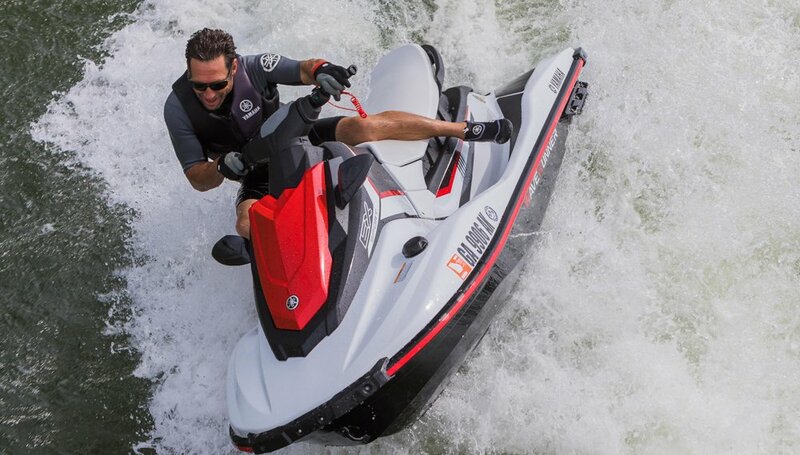 The 1,049cc TR-1 engine is slightly detuned to produce an even 100 hp; the craft weighs in at only 584 pounds. 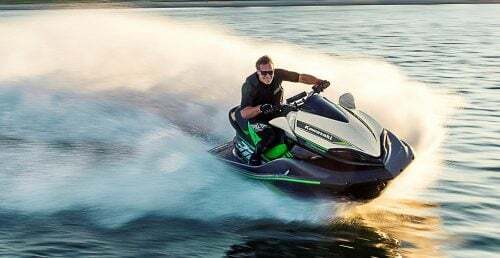 Pull the throttle and you’ll note acceleration similar to the VX and a top speed of about 50 mph. That’s a slight edge over the Spark in its 90 hp configuration. The EX also boasts more fuel capacity (13.2 gallons). 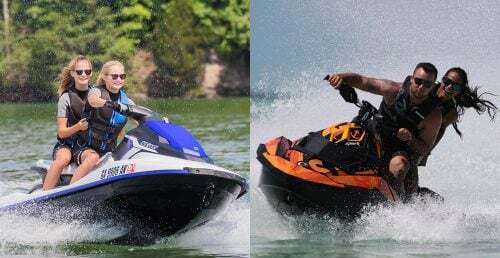 Yamaha claims better fuel efficiency to boot. That definitely gives the EX more range, although we haven’t verified the fuel efficiency claim. As you would expect in this price range, style and features are streamlined. The bow and front design are simpler, though still clearly display that familiar Yamaha, somewhat “masculine” styling. 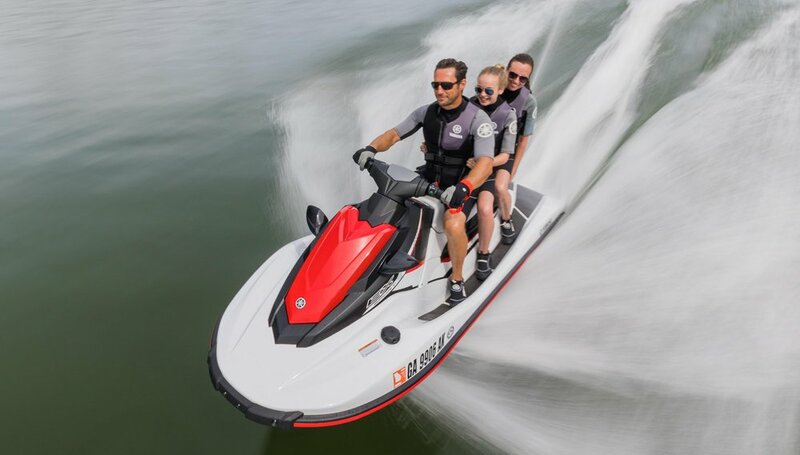 The seat is narrower to stay in proportion with the slimmed design, but engine access is maintained with a clever composite base that is separate from the deck. With cowling on, basic engine access is maintained, meaning you can still do common maintenance tasks, like charge the battery or check the oil level. Should you need to access the entire engine, the sub-cowling can be unbolted from the deck to offer unencumbered access. Both deck and hull remain SMC fiberglass, just like other boats in the lineup. 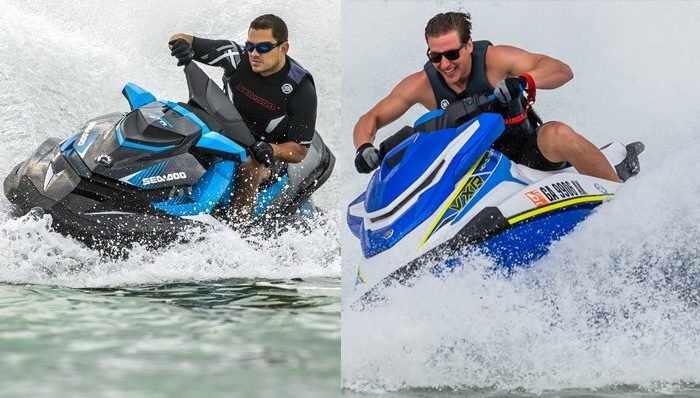 The 2018 Yamaha EX Sport falls in the middle of the brand’s three-model EX lineup. It offers mechanical reverse (the base model does not), but stops short of including the RiDE system (that’s reserved for the Deluxe.) Mechanical reverse works fine for the application, but it doesn’t offer the ease of low-speed handling provided by RiDE, nor the stopping power at speed. 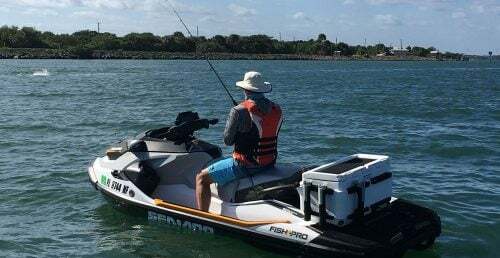 Sport models also get dual rearview mirrors to keep tabs on action in your wake, and over seven gallons of storage (split between a large glove box, shallow bow tub and under-saddle compartment). Also included is a narrow, spring-loaded boarding step to the right of the pump outlet, ski tow hooks and traction mats. The Sport also comes in two metallic color combinations, a Pure White with Torch Red or a Yacht Blue. Competition for the 2018 Yamaha EX Sport? 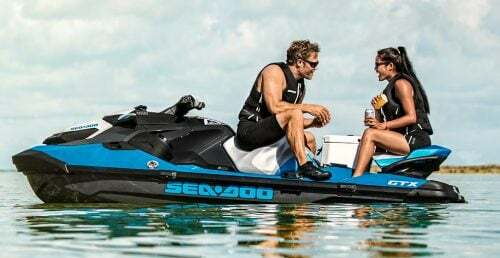 Obviously the frequently mentioned Sea-Doo Spark, although to be more apples-to-apples that would be a Spark in three-passenger trim and with the 90 hp HO engine, along with a boarding step upgrade, traction mats, bow storage bin and manual reverse kit. Those upgrades put the Spark around $7,200, compared to the EX Sport’s $7,699. 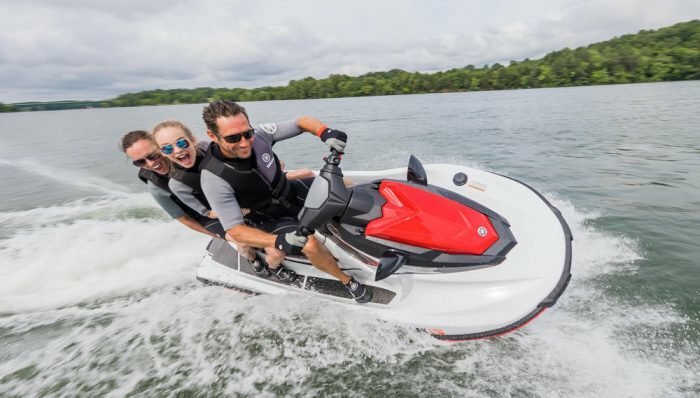 Yamaha clearly thinks more passenger, fuel and storage capacity, a little more power, and a fiberglass hull give the EX Sport an edge. I suggest trying both craft out…and making a judgment for yourself.